Giada presents her take on this iconic Italian "hunter's dinner." You might also like these Fantastic Roast Chicken Recipes. 1. Sprinkle the chicken pieces with 1 teaspoon of each salt and pepper. Dredge the chicken pieces in the flour to coat lightly. 2. In a large heavy saute pan, heat the oil over a medium-high flame. Add the chicken pieces to the pan and saute just until brown, about 5 minutes per side. If all the chicken does not fit in the pan, saute it in 2 batches. Transfer the chicken to a plate and set aside. Add the bell pepper, onion and garlic to the same pan and saute over medium heat until the onion is tender, about 5 minutes. Season with salt and pepper. Add the wine and simmer until reduced by half, about 3 minutes. Add the tomatoes with their juice, broth, capers and oregano. Return the chicken pieces to the pan and turn them to coat in the sauce. Bring the sauce to a simmer. Continue simmering over medium-low heat until the chicken is just cooked through, about 30 minutes for the breast pieces, and 20 minutes for the thighs. 3. Using tongs, transfer the chicken to a platter. If necessary, boil the sauce until it thickens slightly, about 3 minutes. Spoon off any excess fat from atop the sauce. 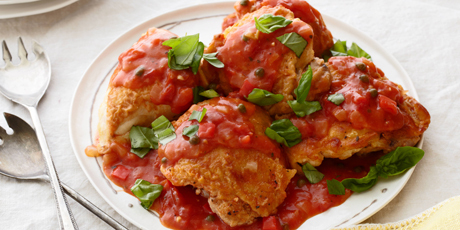 Spoon the sauce over the chicken, then sprinkle with the basil and serve.